By April Hunt on Friday, November 13th, 2015 at 6:00 p.m. The second Democratic debate Saturday promises to be a much smaller affair than the latest GOP contest. Only three candidates will take the stage in in Des Moines, Iowa: frontrunner and former Secretary of State Hillary Clinton, Vermont Senator Bernie Sanders and former Maryland Gov. Martin O’Malley. That will make the session, which airs at 9 p.m. on CBS and its radio affiliates (and stream online here) a chance to go deeper on the issues at play in the race. PolitiFact will again fact-check the debate. Below are our most recent look into the candidates’ claims. "Women fill two-thirds of minimum wage jobs." Clinton recently made a bold statement on women in the working world in a bid to win female votes across the nation. Clinton said, "Women hold two-thirds of minimum wage jobs." Her campaign referred us to a credible May 2015 study that supports her claim. According to the study, 62.7 percent of minimum wage workers age 16 and older are women. That’s almost, but not quite, two thirds. In addition, that study ignored complexities like minimum wage workers in places that have a higher wage already and who would benefit from changes relating to tips. Clinton is largely on point with her numbers. We rated her claim Mostly True. "When President Obama was running for re-election … Senator Sanders was trying to find someone to primary him." O’Malley has struggled to gain attention in the increasingly two-person race but managed to get attention with his claim in the first debate that rival Sanders didn’t support Barack Obama’s re-election. O’Malley said, "When President Obama was running for re-election … Sen. Sanders was trying to find someone to primary him." As a sitting senator, Sanders' comments at a minimum were provocative: He didn't think it was a bad idea for a candidate to run against Obama in the primary. He spoke positively of such a scenario several times. When Sanders endorsed Obama, Sanders said it was because Obama was preferable to Romney. That doesn’t mean Sanders was actively searching for a candidate to actually run against Obama. 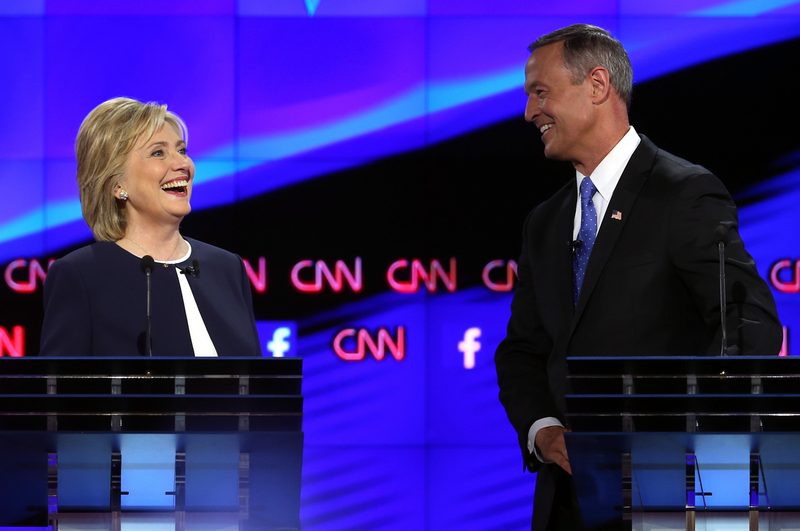 We rated O’Malley’s claim Half True. "Over half of the black workers in this country earn less" than $15 an hour. Bernie Sanders on Nov. 6, 2015 in a Democratic presidential candidates’ forum in Rock Hill, S.C. When asked how to win support of African-American voters, a crucial block in Democratic races, Sanders responded in part before an audience at an all-candidates’ forum in South Carolina by citing his economic platform. "I have the economic and social justice agenda now that, once we get the word out, will, in fact, resonate with the African-American community," Sanders said. "We're talking about raising the minimum wage to $15 an hour. … Over half of the black workers in this country earn less." Depending on the time frame used, the data shows that roughly half of black workers earn less than $15. The most recent data shows that half earn less than $15.60, which is a little higher than what Sanders said, but his number is not far off. We rated his claim Mostly True.